Are you looking for the best facility for the elders to move into? Do you feel reluctant on leaving them alone at a senior care facility? Do not worry as we are here for help. 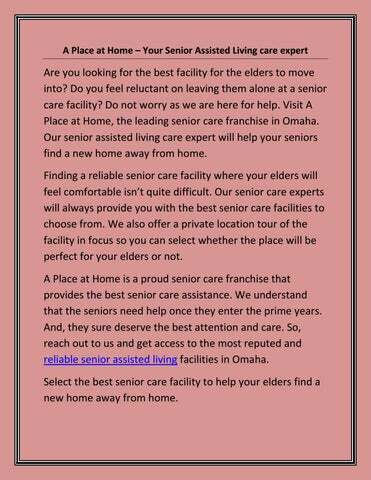 Visit A Place at Home, the leading senior care franchise in Omaha. Our senior assisted living care expert will help your seniors find a new home away from home. Finding a reliable senior care facility where your elders will feel comfortable isnâ&#x20AC;&#x2122;t quite difficult. Our senior care experts will always provide you with the best senior care facilities to choose from. We also offer a private location tour of the facility in focus so you can select whether the place will be perfect for your elders or not. 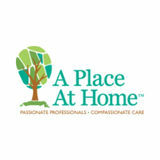 A Place at Home is a proud senior care franchise that provides the best senior care assistance. We understand that the seniors need help once they enter the prime years. And, they sure deserve the best attention and care. So, reach out to us and get access to the most reputed and reliable senior assisted living facilities in Omaha. Select the best senior care facility to help your elders find a new home away from home.